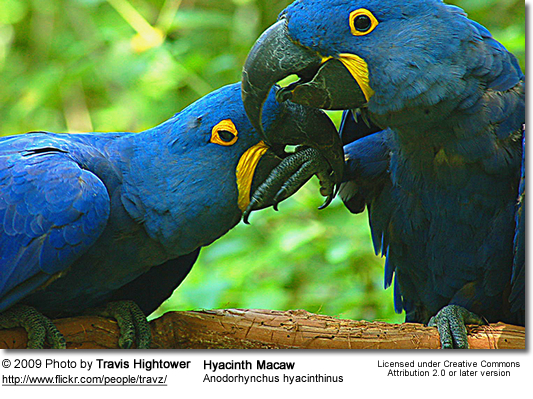 Hyacinthine or Hyacinth Macaws (Anodorhynchus hyacinthinus) have the distinction of being the largest flying . The Hyacinth population in the wild is estimated to consist of only about five thousand individuals. They are only common in a few localized areas with original habitat and, except for these few areas, have disappeared from most of their former range. Their decline has been attributed to habitat destruction, trapping, trade and hunting. It is assumed that several thousand of them exist in captivity. 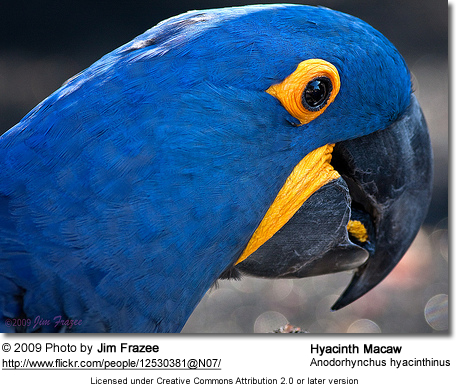 The popularity of the hyacinths as pets has taken a heavy toll on their population in the wild. Efforts are now ongoing to protect the remaining populations in their natural habitat. 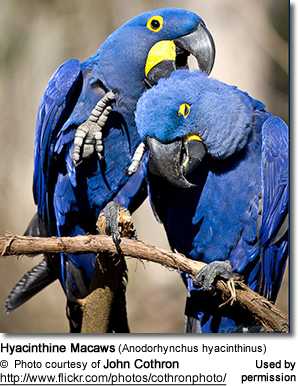 Every effort should be made to place captive breeding-age birds into a well-managed breeding program, as the success will dictate as to whether or not we will be able to enjoy this parrot in the future. Historically, their native range stretched from northern Brazil in localities along northern reaches of Amazon, ranging west to Rio Tapajós and south across central and southern Brazil from Piauí and southern part of Maranhão across Goiás and western Bahia to Minas Gerais and Mato Grosso; eastern Bolivia and most northeastern part of Paraguay. However, today they are absent from most of their former range due to habitat loss, hunting and capturing for the pet trade. The Hyacinth survives today in three known distinct populations in South America: southern Brazil, eastern Bolivia and northeastern Paraguay. It is possible that smaller, fragmented populations occur in other areas of its range. Pairs or small groups of them (6 to 12) are typically seen in the wild. These noisy groups can easily be heard due to their loud calls. If approached, they will fly into the air, circle for a moment before returning to their perch. They inhabit open and semi-open areas with tall trees; cerrado vegetation, Savannah with palms and groups of trees; marshland and flood areas with buriti (Mauritia sp.) palm groves. 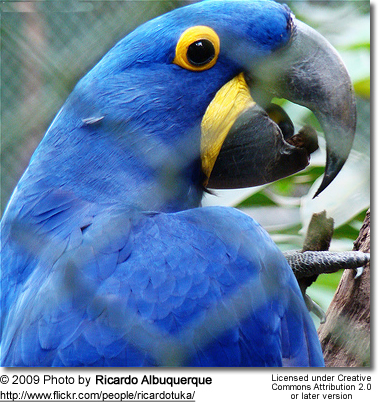 They typically prefer gallery forest and are much rarer in rain forest or along forest edges. They usually roost on tall Acrocomia palms or trees. During the day time they often fly considerable distances to and from their favorite feeding sites. They will either forage in the trees or on the ground on palm fruits. 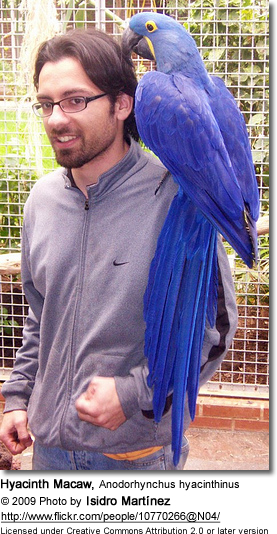 They are the largest flying (40 inches) in length and weighing in at 1,200 to 1,450 g (42 - 51 oz). The wingspan is about 130-150 cm (51 - 60 inches). 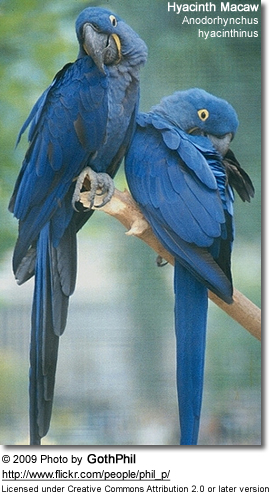 It has a solid blue body of feathers, similar to the color of indigo. The wings are slightly darker blue. The tail and wing undersides are blackish. It has a strong black beak capable of a beak pressure that can easily disassemble the bars of a welded wrought iron cage in a short time. 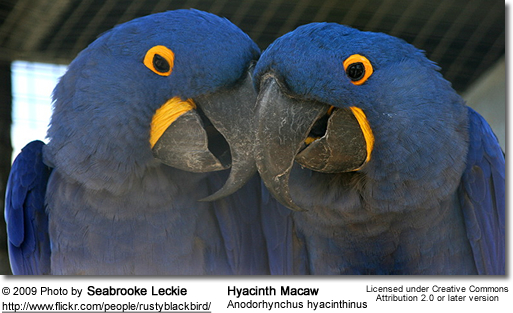 There are bright yellow markings along the sides of the lower part of the beak and circling its solid dark eyes. 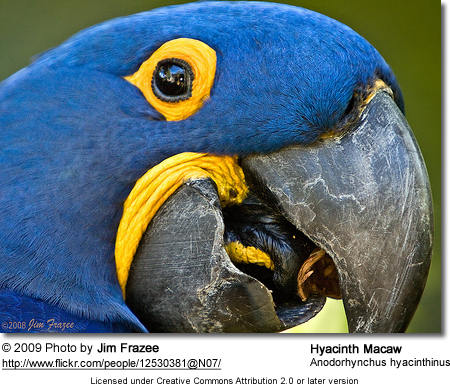 Unlike other species of macaw, it does not have a white patch of featherless skin around the eye. The irises are dark-brown and the feet dark grey. 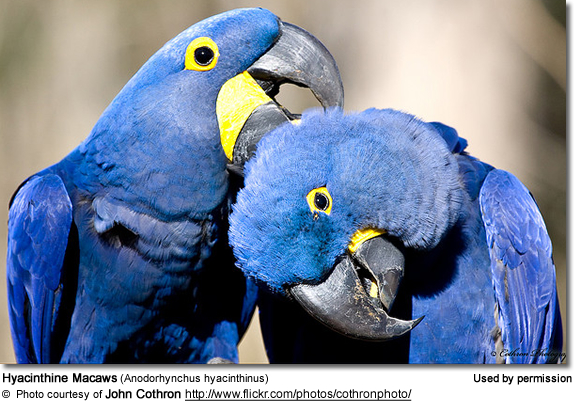 The female and male are nearly indistinguishable, although the female is typically a bit more slender. Juveniles have a shorter tail and the upper bill (mandible) is paler. Their loud calls are often described as gurgling. The alarm calls are harsh and ratcheting. The Hyacinth's primary diet consisted of palm nuts - most likely the Yatay (or Chatay) palm (Butia yatay) - and palm fruits, especially Acrocomia lasiopatha, Astryocaryum tucuma, Attalea phalerata, Acrocomia aculeata, Syagrus commosa, Attalea funifera. 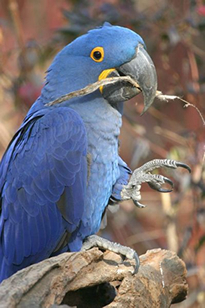 Even though their beaks are strong enough to crack even hard-shell nuts, they will often feed on palm nuts that were excreted by cattle and are, therefore, softer. They feed on ripe and unripe fruits, nuts, berries and vegetable matter. Likely insects as well ingested together with the fruit. One Hyacinth has been observed feeding on water-snails. 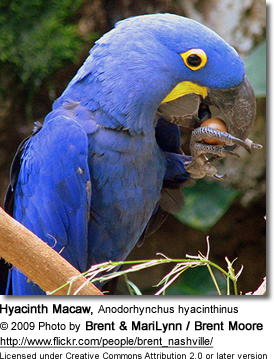 Many parrots will eat large insects / small mammals to satisfy their need for added protein (particularly during the breeding season). They typically nest in preexisting holes in living or dead trees, palms and - in some areas - in the crevices and hollows in cliffs. The tree cavities are usually between 4 and 12 m (12 and 40 ft) from the ground and measure about 50 cm (20 ins) in diameter and 29 cm (11.5 ins ) in depth, from entrance to bottom of hollow, which is often at the same level as the entrance. The entrance hole is usually between 5 x 7 cm (2 x 3 ins) and 40 x 25 cm (16 x 10 ins) in diameter. The average clutch consists of one or two eggs, each egg measuring 53.0 x 40.0 mm (2.08 x 1.57 ins). Usually, out of those two hatchlings, only one survives, as the first egg hatches several days before the second; and the younger hatchling usually can't compete with the older for food. Even the surviving nestling has a poor chance of survival, as many of them are preyed upon or die because of illness. Others are removed from the nest (as pets or for the trade) - further reducing the number of young available in the wild. The remaining young usually stay with their parents until they are about six months old. They attain breeding age when they are about seven years old.